Dr. Joseph F. Burkard received a BSN from George Mason University, an MS in Nurse Anesthesia from George Washington University, and a DNSc from the University of Tennessee specializing in critical care, acute care, and nurse anesthesia. For his dissertation, he conducted a “bispectral analysis and motor activity assessment in ICU mechanically ventilated patients”. He recently retired as a Navy Commander, Certified Registered Nurse Anesthetist after completing 31 years of naval service. He had been stationed at the Naval School of Health Sciences, San Diego, where he was clinical coordinator/department head for the Navy’s Nurse Anesthesia program. Dr. Burkard’s research focus includes post-operative complications, stress management, post-traumatic stress in the returning veteran, and crisis management simulation training. 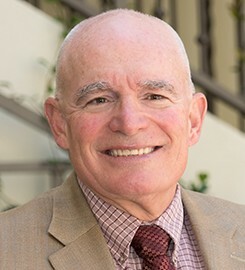 He has spent the past five years as the vice-chairman of the Naval Medical Center San Diego institutional review board for research where he has been responsible for ethical practice training and numerous research projects. Dr. Burkard has taught for the past ten years in southern California nurse anesthesia programs and in 2000/2002 received the “Instructor of the Year” award. His expertise includes working with students in simulation critical care settings to refine their crisis management and critical care skills. Dr. Burkard is past president of the California Association of Nurse Anesthetists where he continues to work on leadership, policy, and ethical issues in advanced practice nursing. Dr. Burkard has also served as educator representative for the American Association of Nurse Anesthetists Council on Accreditation focusing on standards for accreditation of nurse anesthesia educational programs. He currently maintains his clinical anesthesia practice at University of California San Diego. For a detailed biosketch in PDF format, click here. Submit changes to Joseph Burkard's profile.